On the outside of a historic building along Marche Champlain in Old Quebec, Canada, a sign advertises for the Spag&tini, a family restaurant. The sign outside the Spag&tini Restaurant along the Marche Champlain in Old Quebec City, Canada is attached to an iron pole extending from the stone walls on a historic building. The Spag&tini is a family oriented restaurant which opened in 1984 and has a menu outlining various styles of Italian food as well as steak, veal and fish. 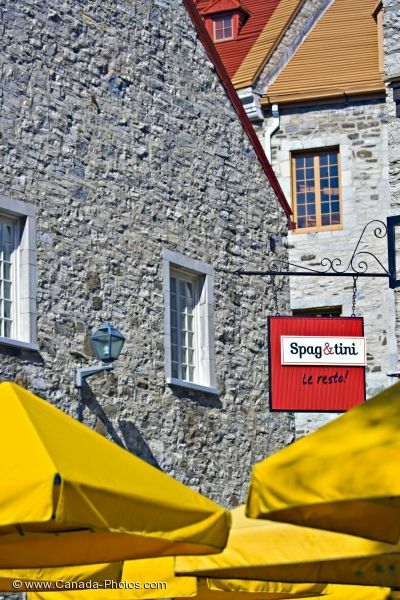 Located in the heart of Old Quebec, the Spag&tini is owned by a husband and wife where they have an outdoor patio along the riverside with a quiet and cozy atmosphere inside. This restaurant is open daily during the year and is reasonably priced to compliment any family. Spag&tini Restaurant Sign along Marche Champlain in Old Quebec, Quebec City, Quebec, Canada. UNESCO World Heritage Site. Picture of the sign outside a family restaurant along Marche Champlain in Old Quebec, Canada.